Siesta Energy…Germany’s 40 Gigawatts Of Installed Wind Capacity Habitually Fails To Report To Work! Browse: Home / 2015 / November / 04 / Siesta Energy…Germany’s 40 Gigawatts Of Installed Wind Capacity Habitually Fails To Report To Work! We already know that solar energy refuses to show up for work at night and also for the most part when it’s cloudy or wintertime. Green energy proponents like to tell us that when the sun is AWOL, we can always switch to wind. The wind, after all, is always blowing somewhere, they like to tell us. Unfortunately that is so far from the truth. The following chart shows Germany’s wind energy output (shaded blue) over the past 7 days compared to the power consumed (curve). As one can see, the country’s 40 GW of installed capacity has gone into the habit of taking afternoon siestas, right when power demand is at a high, delivering a sorrowful a pittance. 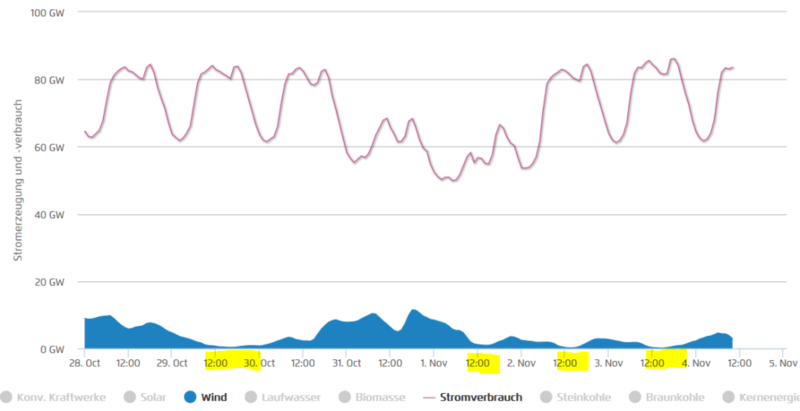 Germany’s 40 GW of installed wind power capacity took afternoon siestas 4 times over the past 7 days (marked yellow). So far this month German wind power has failed to deliver even 10% of its rated capacity. Chart source: Agora. Yesterday early afternoon the 40 GW of installed capacity managed to deliver a puny 0.168 GW, or only 0.4% of its installed rated capacity. That’s like 4 people showing up for work in a company of 1000 employees. According to Wikipedia here, Germany’s wind turbines have barely put out over just 17% of their installed rated capacity over the period of 2001 – 2013. But that’s the least of wind’s problem. The big headache is the energy’s unpredictability and its wildly fluctuating supply. Often the wind blows when you don’t need the power, or it just doesn’t show up when you could really use it, like midday. Good thing that there are still the reliable coal, nuclear and fossil plants on line. But the energy can be stored! Wrong. The technology for the scale of storage that is needed to keep a grid running smoothly does not exist. and there are no signs that it will anytime soon. Yet the mad rush to install the siesta-prone energy continues unabated. We have a beautiful sunny end of october start of november over here. So there was actually a rather big amount of solar. Solar was actually approaching 50% output of installed capacity a couple of times over the last few days. Perhaps you didn’t notice, but the sun is AWOL 16 hours a day of every day at the moment, and is only really producing 5 hours a day (if not obstructed by clouds). sorry, my second link in the post above should have been to SMA. I messed it up somehow. If you look at the data on a good day (like the 03.11. yesterday) you will see that solar is pumping out about 10 GW from 10am to 14:30 in the afternoon. That is replacing 10 nuclear reactors. That is replacing 10 nuclear reactors during 4.5 hours of the day. Hey, electricity for 4.5 hours while the sun is shining – and none after dark. Last I checked nuclear reactors work at night. For four and a half hours. The other nineteen and a half hours, you can do things like read by candlelight. Cook over a Coleman Stove. Please read “Our data calculation model” on the SMA website. Don’t mistake their numbers for a reality. I don’t know how close to a reality they may come. But these replies miss my point: wind, which is supposed to provide about 10% of electricity, was producing less than 1% over a certain amount of time. Solar PV, which is supposed to produce about 1% was having much bigger numbers. we need to look at other data, not at extremes. Not only that, but the graph makes it crystal clear that energy generation from solar sources is not only very little but as well as for only a small fraction of demand on each day, and only if the sun shines. Expand the graph to cover all of last year. and you will see that solar energy generation was almost completely lacking during December, January and February. Those three months also happen to be the interval with the highest energy consumption in the whole year. In other words, during the period of the highest energy demand throughout the year, solar energy generation is not merely insufficient but totally lacking. It is at the very least somewhat irrational to insist that those circumstances are in any way advantageous. You appear to be truly and completely blind to the reality of that, totally blinded by fanatical devotion to ideology. Sod mustn’t have read the memo. sod, if Sister Janice saw me writing something like that (based on the graphic on our link) in my old arithmetic class, she would have given me a good rap across the knuckles with her ever-present 12 inch ruler for such foolishness. Area under the curve sod, area under the curve. Amounts to approximately “didley-squat” in total contribution. But again, sod, thanks for the DDOC and I am certain that there will be a 97% consensus amongst the gents at the trading desk that this is another example of ClimateMath™. Charles Ponzi used this kind of mathematics extensively in the 1920’s and it has since been modified and expanded in use by the coterie at the IPCC. In all fairness, I used this kind of math many years ago when I was an insecure young man in pursuit of the ladies. I used it to describe a particular physical attribute. Some of the ladies were not clever in math, but, to my dismay, all were good at reality. Translation: How can we continue looting the customer even when there is an oversupply of our product. We see here the typical behavioral patterns of communist central planners to try and figure a way to save their central planning even in the face of resulting shortages mixed with momentary gluts of supply. The simple time-tested solution, a free market, means the end of their reign – so the only SOLUTION is automatically ABOLISHED. Keep the faith, sod. Yes, I’m really interested in the subject and it’s beyond belief that anybody should consider solar/wind by now anything more than a (very) expensive mistake. The Agora, EEX, SMA, netztransparenz etc. graphs all show in brutal detail the impossibly large gap between wishful thinking and reality. I suggest you start following Euan Mearns’ and Roger Andrew’s blog (Energy Matters) for cold, hard numbers instead of armwaving ‘we had some sunny days here’ (today: 12.9GW peak @ 38GW installed). Read up on how the great ‘El Hierro’ experiment is doing after spending 80 million Euros on ‘100% energy independence’. Thanks for that link. It is really worth reading and everybody should do so. I really love the amount of data presented there! El Hierro is an experiment. The plan was, to get 80% electricity from wind at the end of the year but both september and october were very bad with basically 80+% diesel. I agree with their analysis. More wind power is needed, even if this leads to waste on some occasions, if the want to go 100% renewables this way. and while i love their data analysis (as i said above) we really need more informations, to find out, what is happening. The wind data from the airport shows lower wind, but does not explain why wind power went basically awol for two months. There might be some easy explanation (technical problems?). But again, thanks for the link! The way it looks, El Hierro might be approaching 50% renewables in the long run, and 100% is still a little bit in the future. But don t forget, these islands tend to run on diesel anyway, so even very expensive wind/storage solutions might still save money in the future and other islands will definitely profit from the experiences of this project! Sod The whole bloody thing is an experiment and one that was doomed to failure from the beginning.All it has done is made a few scammers very rich. Are you one of them? And Sod’s cronies are really hurting the poor with the ever increasing cost of energy. Not that they care about the proles. The wind ain’t blowing and the sun ain’t shinning. Just as well it isn’t cold. we were just discussing how cold this autumn would be. All those shortlived localized extrema – since the beginning of the grand solar minimum – are exactly as reported from times of the Maunder or Dalton minimum, a very excentric jetstream and the according pressure systems bringing cold to one region, heat to the next, one month this pattern, next month the opposite. Nothing of this has been predicted by the warmunists or their models. They might just push the Western world into communism, but that will stay their only achievement, modern Lysenkos that they are. ??? We already pay absurdly high prices for electricity in Germany. WE ARE ALREADY THERE. Thanks to wind turbine fanatics.